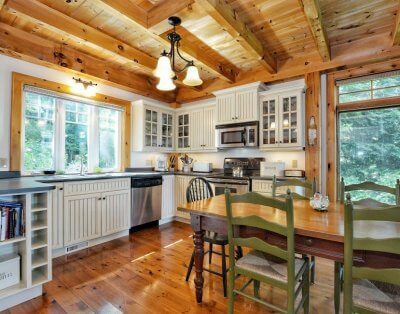 Exclusive and enchanting cottage on a large secluded point of property on Long Lake! With a spectacular 850 feet of lakefront, this cottage is surrounded by water on 270 degrees – watch the sun rise from one side of the property and watch it set from the other! Perfect for a family, this lakeside paradise has a spacious cottage and matching bunkie, for a total of 5 bedrooms and 3 baths. 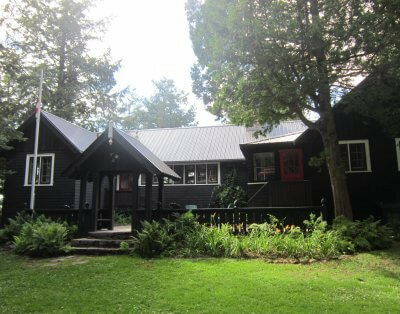 Windsor Point Cottage is located just 2 hours north of Toronto, on Long Lake, in Bala, Muskoka. It’s just a ten-minute walk into town where you can enjoy shopping, dining, the farmers market, and don’t miss the weekly ski show on Tuesday nights! As you take the private wooded drive onto the property it opens up to a captivating and irrestible tranquil retreat. Flat and child-friendly, and with attention to every detail, this sensational property has something for everyone in the family. A beautiful stone garden path passes around the delightful campfire area and leads you down to the granite shore with windswept pines and sundrenched dock. Relax in the Muskoka chairs as you take in the magnificent panoramic view. Swimming is excellent from the dock. Take the trail to your very own private sand beach, complete with pint-sized Muskoka chairs, sand toys, and water toys. Another path winds around the backside to a hidden granite shoreline– the perfect hideaway for teens! Explore Long Lake by kayak or canoe or paddle boat! At night, the lit paths are enchanting and magical as they wind their way through the gardens. Enjoy beautiful summer evenings by the campfire. This cottage has been professionally renovated and boasts a huge, bright interior that is airy, modern and stylish. All rooms are located on one level, with a total of 2,800 square feet of living space. The sun-filled Great Room features comfortable cozy sofas, complete with flat-screen Satellite TV and Blue Ray DVD player. A corner woodstove will take the chill of a cool summer evening. The dining area boasts a large wooden harvest table and seating for 10 – room for all your family and friends! The fresh pine kitchen is fully equipped and has a smaller table and chairs and a breakfast counter with stools. A propane barbecue is located just outside the kitchen on the side deck, and the expansive deck off the front of the cottage features an outdoor dining table, chair and umbrella set to dine al fresco! The screened Muskoka Room, with beautiful views of the lake and woods behind the cottage, is a cozy and inviting space to read a book, play some games. The spacious Master Bedroom, with King bed, features wall to wall windows facing the lake and French doors to the front deck, offering a fantastic cross breeze. There is an immaculate 5pc ensuite with jacuzzi tub and full glass shower and two sinks. The second bedroom boasts a King bed as well, satellite TV, and two wrap around walls of windows facing the lake and offering more of that lovely breeze. This bedroom features an innovative built-in cupboard: stylish, versatile and practical! The third bedroom has a Queen bed, and the fourth bedroom has a double/single bunk – perfect for the kids! Two more spotless bathrooms: a 2pc and a 3pc with shower, and a laundry room with convenient washer/dryer, round out the floorplan. There is an adorable bunkie just off the back of the cottage that features a sleeping space with 2 Twin beds, that can be pushed together to make 1 King. This space offers some privacy and fantastic sleeping where you can listen to the water lapping at the shore through the night.